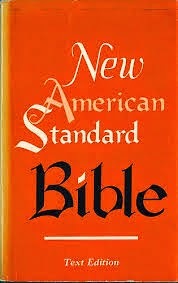 A friend and regular reader of the blog recently sent me a link to this online article by Daniel Stanfield comparing the New American Standard Bible (NASB) and the King James Version (KJV). Though complimentary of the KJV, the author, who describes himself on his website as “a life-long Christian worker and Bible student, and a careful expository Bible student” and also as “largely self-taught,” makes clear his preference for the NASB (as the title of the article obviously evidences: “Why I prefer the NASB over the KJV”). The friend asked for my evaluation of this brief comparison, so I am going to offer a series of responses. Both the NASB and the KJV Bibles are very accurate literal translations, of excellent scholarship, using the best copies of the original languages which were available to them. Both works clearly and accurately represent the Word of God. Literary quality is excellent for both works, and style is identical. In many places the NASB reads exactly or nearly the same as the KJV. When choosing between these two versions, there are various areas of contrast which I have listed in order of significance. JTR Response: I appreciate the fact that the author does not immediately dismiss the KJV as outdated and irrelevant. I take exception, however, (1) to the general slant of the introduction and (2) to one factual matter. First, as regards slant, he states that the KJV and NASB used “the best copies of the original languages which were available to them.” This implies that the text used by the KJV translators is inferior to the text used by the NASB translators, because we now have superior copies. This begs the question as to whether or not the traditional Reformation text used by the KJV translators (the Hebrew MT for the OT and the Greek TR for the NT) are, in fact, necessarily inferior to the modern critical reconstructions of the OT and NT, which has become the basis for modern translations. I and others do not believe that the modern critical text does, in fact, represent an improvement. I know Stanfield’s article is brief and non-technical, but an argument for this perspective must at least be presented before it might be entertained and certainly before it might be accepted. This argument also contains an inherent contradiction. If the best translations are necessarily the ones that use the most recent version of the modern critical text, then one should abandon the NASB (1971, last updated in 1995) in favor of translations based on more recent editions of the modern critical texts (like the NRSV or ESV). Second, as regards a fact, he states that “style is identical” for the KJV and the NASB. Clearly, however, this is mistaken. In fact, in the paragraphs following the preface, the author himself points to several ways that the NASB is different in translation style from the KJV (e.g., the NASB sets off direct quotations with quotation marks, uses a stanza format for poetry, puts OT quotations in small caps, and capitalizes pronouns referring to the deity). Perhaps what the author means to imply is that both the NASB and the KJV follow in the venerable literary style of Tyndale (for the NT at least) and other English translations that predate them both (e.g., Matthew’s Bible, Bishops’ Bible, Geneva Bible, etc.). This is a claim that is often made (I believe falsely) for English translations which derive from the Revised Version (NT-1881; OT-1885), which was the watershed English translation whose daughter versions eventually dethroned the KJV from its position of dominant English usage. In fact, if you read the preface to any copy of the NASB, the editors will tell you that it comes from a revision of the American Standard Version (ASV) of 1901 which, in turn, came from the Revised Version of 1881/1885. Its stylistic roots are not in Tyndale of the sixteenth century but in Wescott and Hort and the Revision Committee of the nineteenth century. Geneva (1599 ed. ): Matthew 5:14 Ye are the light of the world. A city that is set on an hill, cannot be hid. 15 Neither do men light a candle, and put it under a bushel, but on a candlestick, and it giveth light unto all that are in the house. KJV (1611): Matthew 5:14 Ye are the light of the world. A city that is set on an hill cannot be hid. 15 Neither do men light a candle, and put it under a bushel, but on a candlestick; and it giveth light unto all that are in the house. ASV (1901): Matthew 5:14: Ye are the light of the world. A city set on a hill cannot be hid. 15 Neither do men light a lamp, and put it under a bushel, but on the stand; and it shineth unto all that are in the house. RSV (1946/1952): Matthew 5:14 You are the light of the world. A city set on a hill cannot be hid. 15 Nor do men light a lamp and put it under a bushel, but on a stand, and it gives light to all in the house. NASB (1971, 1995) Matthew 5:14 You are the light of the world. A city set on a hill cannot be hidden. 15 Nor do men light a lamp, and put it under the peck-measure, but on the lampstand; and it gives light to all who are in the house. ESV (2001) Matthew 5:14 You are the light of the world. A city set on a hill cannot be hidden. 15 Nor do people light a lamp and put it under a basket, but on a stand, and it gives light to all in the house. 1. NASB uses “you” rather than “ye” in v. 14. 2. NASB omits relative pronoun “that” in v. 14. 3. NASB uses “hidden” rather than “hid” in v. 14. 4. NASB uses “nor” rather than “neither” in v. 15. 4. NASB italicizes “men” in v. 15. 5. NASB uses “peck-measure” rather than “bushel” in v. 15. 6. NASB uses “lampstand” rather than “candlestick” in v. 15. 7. NASB uses “gives” rather than “giveth” in v. 15. Though on the surface one might say the two traditions are “exactly or nearly the same,” a closer look makes plain that there are clear and consistent differences in vocabulary and syntax. If one compares passages in Tyndale/Geneva/KJV with those in RSV/ASV/NASB/ESV throughout, he can discern two different and distinct “style streams.” This difference is even more obvious in those passages also affected by textual issues. I just grabbed it off Google images, but I like the look of it.